How to Export Disconnected Mailbox to PST & Read Emails? Summary: The topic preliminary focus over the Exchange Offline EDB mailboxes and issues regarding disconnected database. Why is this troublesome for reading emails from disconnected Exchange mailboxes? How EDB converter can helpfully export disconnected mailbox to PST file? What are Disconnected EDB Mailboxes? When association between Live Exchange (Active Directory) and database is disabled then mailboxes goes to an offline or disconnected state. The disabled or detached database is usually considered as Offline priv.EDB file, which does not works with Live Exchange Server (2010, 2003 and Exchange 2007). Even the information (emails, contacts, notes, calendars) stored in disconnected mailboxes becomes inaccessible to associated users. Download Strong to overcome all issues of Disconnected, Disabled or In-active Mailboxes and directly access data without mounting (read all features). How to Read Priv.EDB Emails from Disconnected Mailboxes? is a distinct solution to extract email from disconnected mailbox and save it into Outlook PST file. Although there are numerous inbuilt PowerShell Commads that provides access to disabled and soft-deleted database. However, scripts causes difficulty to novice users and are time taking. What is the Most Convenient Way to Export disconnected mailbox to PST? Deploy Independent EDB converter software, which automates the database extraction process. In GUI mode, users can select desired entities and quickly extract without using any command. Extract email from disconnected mailbox by sustaining email header properties like to, bcc, cc, subject, date etc. Keep folder, subfolders and personal folders in structured format. Recover inconsistent or damaged sectors from database to read priv.edb in correct format. Select multiple or select single mailbox to speedily export disconnected mailbox to PST. The EDB converter software supports entire Exchange editions namely 2013, 2010, 2003 and 2007. Download Freeware for Trial Purpose & Then Buy Full Edition!! Must download freeware trial version of the software for exploring the software functions manually! Freeware tool is limited to convert only 15 items per folder so after satisfaction online buy full version of the software @ $299. 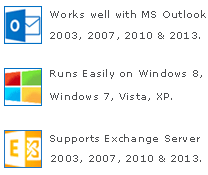 Full version can entirely export disconnected mailbox to PST by supporting Exchange 2010, 2003 and Exchange 2007 editions over Windows based systems.